According to December 2009?data from the provincial Ministry of Housing and Social Development, the number of?those receiving income assistance?in the Expected to Work category increased by?45.4% between 2008 and 2009.? Close to 12,000 more families and individuals were receiving assistance in December 2009 than in the previous year.? By family type, the biggest increase in income assistance recipients were two parent families (a 69% jump), followed by single men (a 59% increase from 2008 based on annual averages). The National Council of Welfare has just released a comparison of welfare incomes in 2008 by family type. A lone parent with a child aged 2 received $11,347 from BC income assistance in 2008, and other benefits including the GST credit and Canada Child Tax Benefit bring that figure up to $16,808. This is $5553 less than the low income cut off for that year.? The peak year for welfare earnings for this family type was $18,183 in 1994. A family with two parents and two children ages 10 and 15 would have received $13,213 from income assistance in 2008 in BC, for a total of $21,016 with other benefits, which is $13,722 below the low income cut off.? This is $2,751 less than the same family would have received in 1994. A single person considered employable would have received $7,700 including other benefits, which is more than $10,000 less than the low income cut off.? A single person with a disability received $11,382 in 2008. A detailed analysis of the inadequacy of welfare rates is available from SPARC BC. Aylon Cohen is combating his way to the end of his BA in Political Science at the University of British Columbia. He is always glad to have the opportunity to step outside of the cold academic ivory tower and engage with the Downtown Eastside community. He is particularly keen on the The Poverty Olympics, as he believes that the best form of protest occurs in a ’space’ of satire. Many thanks to all of our fearless Torchbearers and community organizers who made this journey possible!? Here’s to ending poverty in BC! 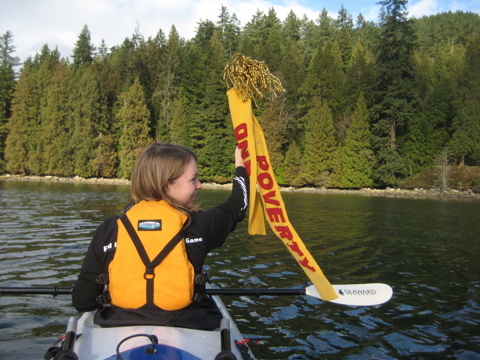 After Nick’s walk with the toilet plunger torch on Friday, it was passed onto Trish and Emily waiting in the kayak for their paddle to Deep Cove. While it had been very calm at Barnet Beach, it was wild and choppy in the mouth of Indian Arm and they struggled through the waves and spray, accompanied by loons, herons, cormorants, and a friendly seal. It was exhilerating and fun. On Saturday, the torch will continue its journey through North and West Vancouver. 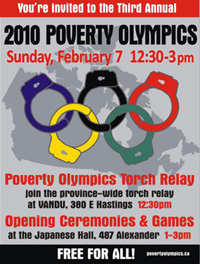 Sunday morning it will travel over the Lions Gate Bridge and through downtown for the Poverty Olympics! Jamison Miller started pushing the Torch at the Production Way SkyTrain station on Lougheed. He pushed it all the way uphill to the Sleepy Lodge on Clarke in Coquitlam. Nick Blomley then took over and started to push just as the rain got heavier. His destination was Barnet Beach, down at the shoreline west of Reed’s Marina. But Nick got the attention of the Port Moody Police Department - “What’s all this, then?” said the constable. On advice of his Sergeant by radio, he ruled the Torch off the road. Barry and Nick packed it up and drove it to Barnet Beach. With the True Torch out of commission, the backup Torch came into play: the toilet plunger with golden ribbons. Nick carried it proudly aloft for 5 kilometers to the beach. The Torch Relay continued unbroken, still entirely self-powered! Earlier, we brought you profiles of two of the Official Poverty Olympics mascots - เกมยิงปลาสุดยอดเกมทำเงินอันดับ 1Chewy the Rat and Creepy the Cockroach.? Now it’s Itchy the Bedbug’s time to shine! 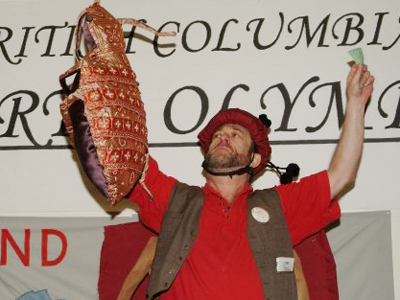 We chose Itchy the bedbug as a Poverty Olympics mascot because he represents what many low income people, especially people who live in residential hotels and rooming houses, have to deal with every day. There is an epidemic of bedbugs in Vancouver. They are extremely hard to get rid of and make life so miserable for people that some refuse to go to their hotel rooms to sleep. Hotels and rooming houses in Vancouver’s Downtown Eastside community?can be?poorly run and filthy, and still often cost more than a person on welfare or disability gets for shelter ($375 per month). But bedbugs don’t only affect?low income?acommodations - exterminators worry that the Vancouver Olympics will? increase the bedbug problem in this city due to the influx of tourists. The Sydney Olympics of 2000 have been blamed for the current bedbug crisis in many major cities.? The Bedbug Registry is a North American service that allows you to check for reports of bedbugs in your apartment building or hotel. Due to Itchy’s notoriety for causing discomfort, he is probably the best known Poverty Olympics mascot.? He’s even been profiled on a bedbug extermination website! 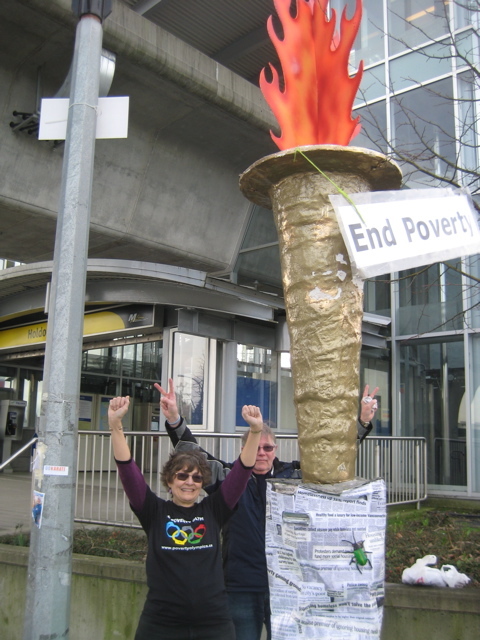 Sarah Bjorknas of Vancouver Catholic Worker House and War Resisters Support dealt with difficult roadways, sidewalks, tree-overhangs, and traffic congestion as she pushed the Torch from New West to Metrotown. But she waved at supportive honkers and at the CTV camera guy who followed us the whole way.Bob and Judy Doll assumed the Torch at Metrotown.? After some negotiations with a Metrotown manager, volunteers were given permission to carry on leafleting and playing Slapshots to End Poverty.? An eagle looked down on all the activity at Metrotown and seemed to approve. - Laugh, have fun, and eat Cockroach Cake. ?